Italian sausages are not just your usual sausage! They are packed with fennel and seasoning and you can often find chilli versions which are equally delicious. They can be cooked whole or, as I have done in this recipe, the sausage meat can be removed and cooked separately. I have paired the sausage with chard which is in plentiful supply all year round. It can be substituted for spinach or cavolo nero if you like but I love the way the slight bitterness of the leaves balance with the rich sausage. When it comes to pasta, you really do get what you pay for. I absolutely love Garofalo’s long spaghetti which you can find here. Each strand is half a metre long so grab a fork and get twirling! 1. Start by bringing a pan of water to the boil. To prepare the chard you need to remove the stalks and keep the leaves separately as they both need slightly different cooking times. Roughly chop the stems and blanch for 1-2 minutes and blanch the leaves for 3-4 minutes; drain well and set aside. When the leaves are slightly cooled, roughly chop. Bring another pan of water to the boil and cook the spaghetti according to instructions. 2. Take a frying pan and add a glug of oil over a medium heat. Add the onion and garlic along with the chilli flakes (if using) and cook for a couple of minutes. Meanwhile, use the sausage meat which has been removed from the skins to form little balls. I make mine about the size of a hazelnut so you get lots of little bites throughout the pasta. Add the sausage balls into the frying pan with the onion and garlic and frying until golden. 3. Add the passata into the pan and bring to a simmer. The sauce is designed to give the spaghetti a light coating and by the time it has simmered it really does reduce down so don’t be alarmed if it seems a lot for two people. Add the drained chard stems and leaves and cook for a further 5 minutes. When ready, tip the cooked spaghetti into the pan and toss so each strand of pasta is coated in the sauce. Serve in warmed bowls with the toasted pine nuts sprinkled over and a good grating of parmesan to finish. 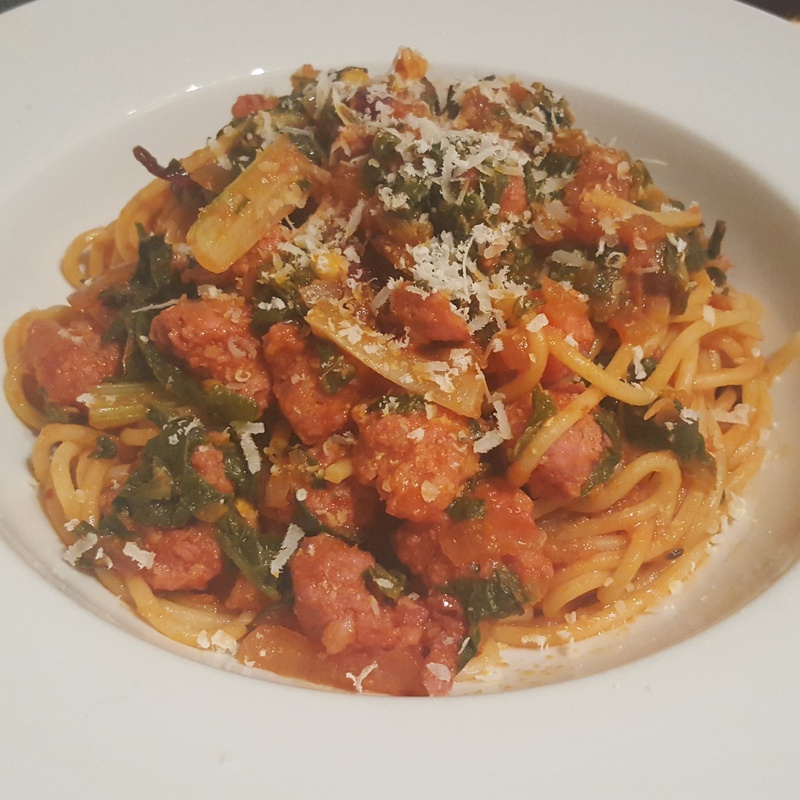 Italian sausage, chard and pine nut spaghetti- a celebration of Italian flavours! Chard, butternut squash and goat’s cheese gnocchi is the perfect way to make use of the new season vegetables and boost their flavour even more! Chard can be found in most supermarkets but can often be overlooked in favour of its better known friends such as kale and spinach. It’s flavour is akin to beetroot leaves but it is so versatile and just all the colours it comes in is incentive enough to pick up a bunch. I used butternut squash in this recipe but autumn is the time where there is an abundance of different varieties of squash so play around and experiment. Choose a sweeter squash for this recipe to balance the slight bitterness of the chard and the savoury goat’s cheese. I have used Carmarthen ham in this recipe which you can learn more about and order here: http://www.carmarthenham.co.uk. If you don’t use this then simply replace it with parma ham or omit for a vegetarian meal. 1. Start off by taking a large frying pan and heating a glug of oil over a medium heat. Add in the onion, garlic and sage and cook together until they are softening. I often add a small amount of sea salt to the onions to draw the moisture out and this works well. Take the diced butternut squash and add to the pan; cover and cook the squash until tender. This will usually take around 15-20 minutes but keep checking as it will depend on the freshness of the squash and the size of the pieces. Stir from time to time. 2. Meanwhile you can prepare the ham; cut 50g of the ham into bite size pieces and reserve the other 20g. I then placed the reserved ham in a hot smaller frying pan and crisped it up before allowing to cool and cutting finely to sprinkle on the finished dish later. 3. For the chard, make sure the leaves have been separated from the tougher stalks as they need to be treated differently. Cut the stems into centimetre pieces and roughly chop the leaves. Quickly blanch the stems in a pan of boiling water for around 1 minute before plunging into iced water and then draining. Shocking the stems in cold water stops them from cooking further and also helps them to retain their colour. Add the cooked stems and the leaves to the pan with the butternut squash which should be lovely and tender. Pop in the squares of ham. 4. I find that fresh gnocchi can vary in texture and firmness a lot so I simply boiled the gnocchi for a minute and a half until starting to rise to the surface of the water before draining. 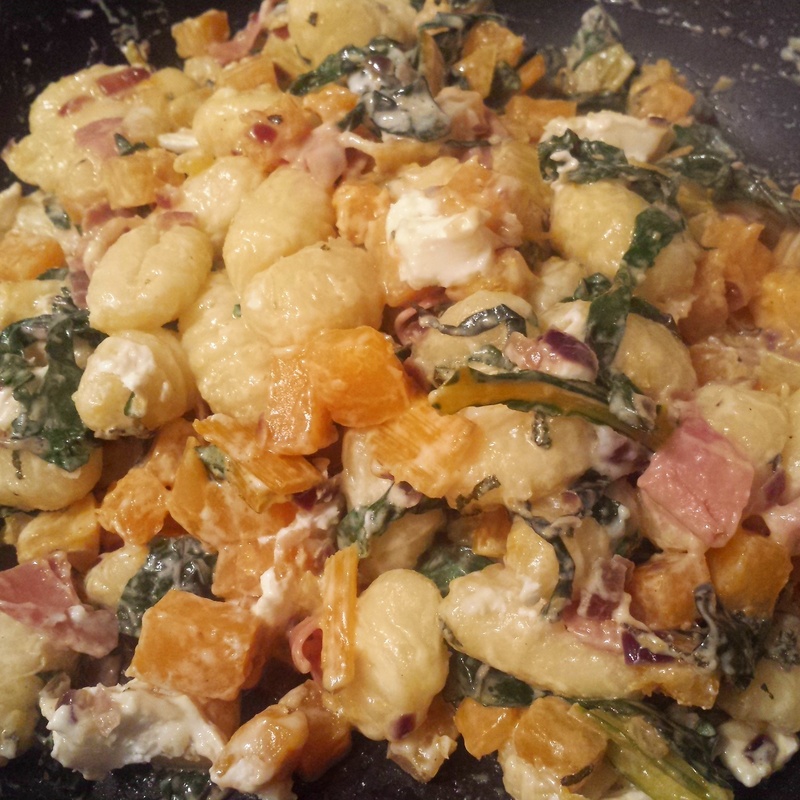 While the gnocchi is boiling, add the crème fraiche to the pan with the squash and chard and stir well to combine. Tip the cooked gnocchi into the pan and combine so each piece of gnocchi is coated with the crème fraiche. 5. Lower the heat to low/ medium and give the gnocchi a few minutes to relax into the pan and combine with all the fresh flavours of the vegetables.Cut the goat’s cheese into small pieces and scatter in the pan. Cook for an additional minute or so to let it start to melt through the gnocchi. If you find the crème fraiche gets a little claggy then add a small splash of water to the pan and stir in well. 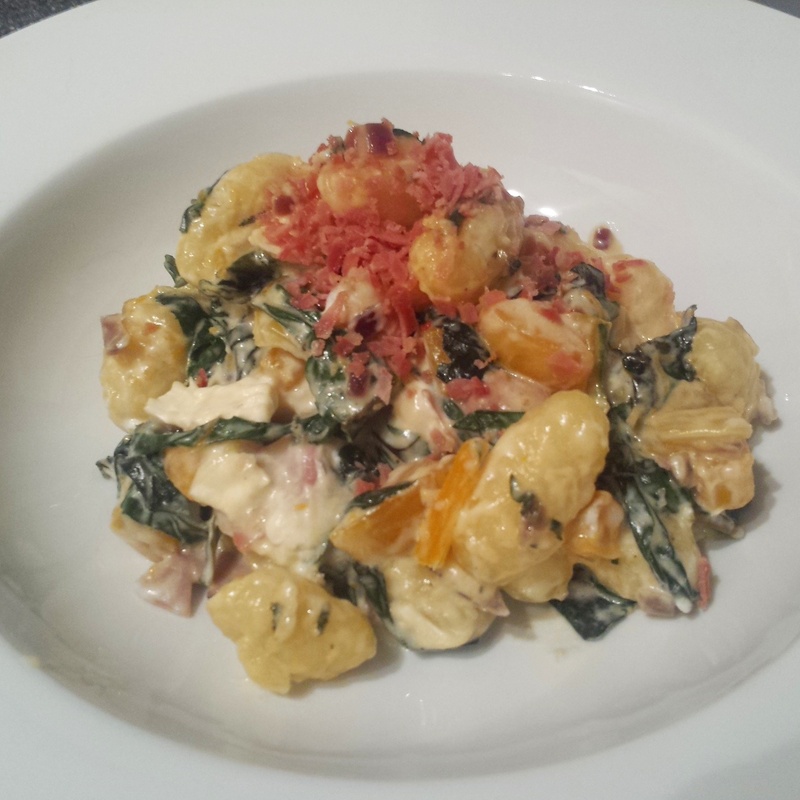 Serve the gnocchi in deep bowls and add a liberal sprinkle of the crispy ham pieces on top. This time of year is perfect to celebrate the mushroom. Love it or hate it, there are so many varieties to try and choose from to embrace the earthy delight before the wild mushroom season is over for another year! To make this recipe fully vegetarian then you can substitute the cheeses with vegetarian alternatives or leave them out if you prefer. Remember that a mushroom is a delicate thing so be gentle when cleaning them; simply wipe any dirt using a piece of kitchen roll. I have used field, chestnut and porcini mushrooms here but get creative and try different mixes. 1. Before you start soak the porcini mushrooms to rehydrate them and drain well and squeeze out any excess water. Keep hold of the liquid for – never throw this away, it has so much flavour. Heat the butter in a pan over a medium heat and cook the shallot until softened. Next pop in the garlic and thyme leaves and cook for a further minute. 2. Increase the heat and add the mushrooms and fry rapidly to remove the water from them; cook until soft. Add the wine and bring to the boil for a minute before the stock goes in along with the porcini liquid. Simmer for 10-15 minutes until the mushroom mix has thickened. A few minutes from the end add the chard to cook in the mushroom mix. Alternatively you could lightly steam the chard separately and then add in. Turn off the heat and leave to stand. 3. For the polenta choose an instant variety. Boil in a pan along with 250ml of water plus the thyme and bay according to the packet time. When ready remove the sprigs then pop in the butter and parmesan until smooth and creamy. Add a little more butter if needed. 5. When the polenta is ready, serve into bowls and create a crater in the middle of each bowlful into which you can spoon the mushroom ragout. Pop the Taleggio (or similar) slices or chunks on top and melt under the grill until oozing if you like but it is also great without cheese too. Alternatively you could stir the cheese through the warmed ragout if you prefer. 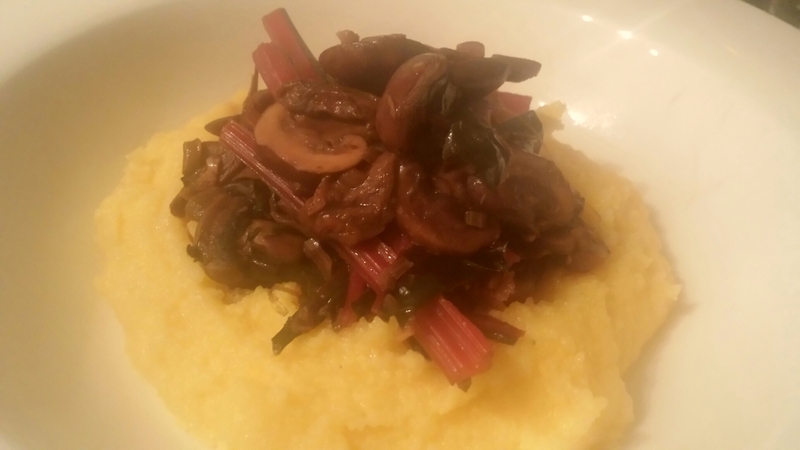 Mushroom ragout- a seasonal celebration of the humble ‘shroom! We’ve all been there. You go to the market and buy a glut of veggies only for some of them to end up in the fridge for longer than others. Never fear! This gratin makes use of leftover chard and spinach would also work well mixed in too. Serve with a meaty main meal or double the quantities to have it as a main meal with crusty fresh bread. 1. First of all make sure that the chard is well rinsed and preheat the oven to 180c/ 160 fan. Remove the leaves and cut any thick stems in half lengthways to it all cooks evenly. Bring a pan of water to the boil and cook the leaves for 2 minutes before adding the stems until softened. You could also steam them if you prefer. Remove the chard from the pan and blot with kitchen towel to absorb any excess water. 2. Take a small pan and melt the butter over a medium heat. Add the mustard and then gradually stir in the cream until all has been added. Bring to a simmer for a few minutes before taking off the heat and adding half of the cheese and season to taste. Gruyere works well but parmesan would also do the trick. 3. Get a small oven proof baking dish and place the chard on the bottom before pouring over the cream mix. 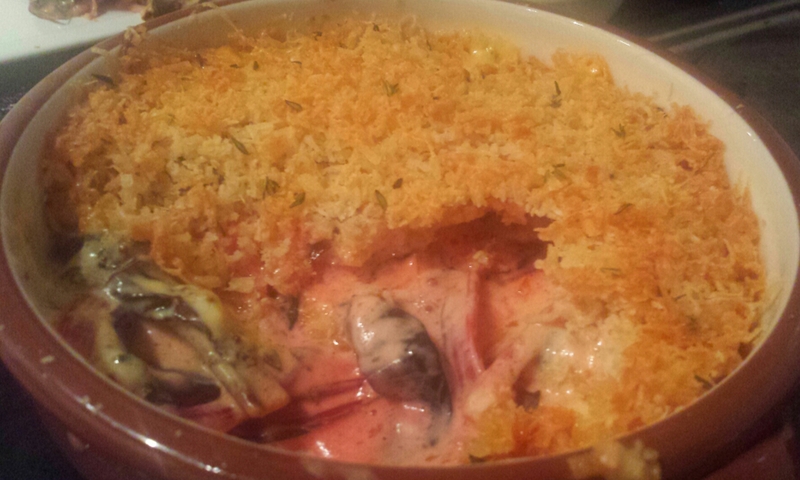 Top with the breadcrumbs (panko go well here) and bake for around 30 minutes until bubbling and golden. I also popped some thyme on the top. Chard gratin- a colourful celebration of this beautiful vegetable!